Marian Mass — Mass in honour of the Virgin Mother, held once each year in May (usually on the first Monday). Council members and their families, members of the parish, and numerous schools are all invited to attend. 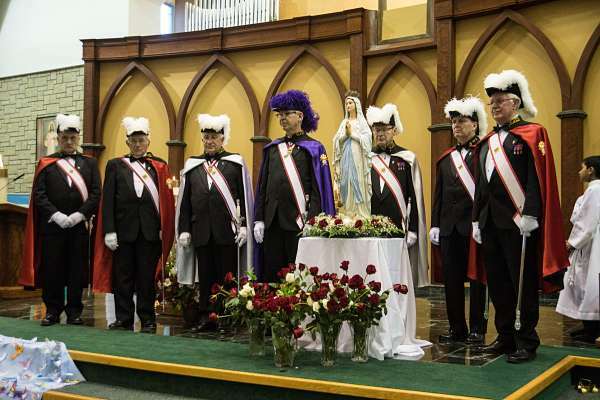 Knights of Columbus Masses — Once per month, at one of the Saturday/Sunday Masses at St. Thomas More, the Knights provide the manpower to fulfill the supportive roles in the Mass (Adult Server, Lectors, and Extraordinary Ministers of Holy Communion). If you are a Knight involved in any of these ministries, please help us out. Vocations — A ministry informing the council of Holy Hours of Prayer, Saturday Rosary, and supporting local priesthood vocation programs. Pennies For Heaven — After each general meeting, a one dollar 50/50 draw is promoted, where 50% of the proceeds go to the winner, and the 50% goes towards vocations. At each State convention, these monies are presented to the State Vocations Director. Holy Hours — Monthly, parish Holy Hours are held (usually after the evening mass on the 3rd Tuesday of the month) in which Knights are encouraged to participate.